There's a bunch of different ways to explore Cambodia and, more specifically, the temples of Angkor. Tour buses will drop you at the main spots, private cars and tuk-tuks can zip you around, and bicycles give you the freedom of exploring on your own. However, the most jaw-dropping option is a flight above the temples in a microlight. At this point you might be wondering: “what even is that? !” Think hang-glider with a massive propeller attached to it, or just check out the snaps below! My trip to Siem Reap allowed for a decent six days of exploring temple, so I was keen to do some of the classic touristy things, as well as something slightly more unusual. Sunrise at UNESCO-listed Angkor Wat is honestly spectacular, but nothing quite prepares you for the hordes of tourists you face when you’re waiting to snap that classic shot. After a three days of exploring on the ground, I was even more eager for something different, and a quick online search threw up a few enticing suggestions. 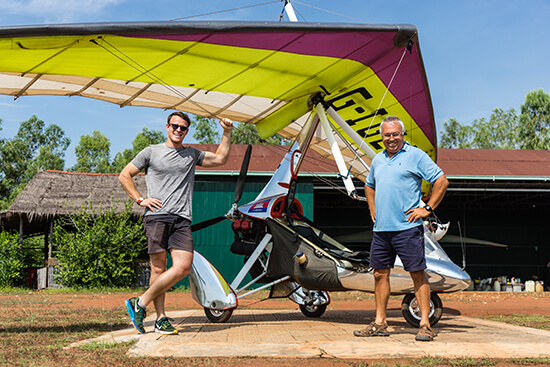 Bicycle tours and hot-air balloon rides popped up first, but after a bit more digging I found microlighting Cambodia, with tours “around lush jungles, floating villages, and flooded forests”. A few crackly phone calls later, I was speaking to Eddie, the microlight pilot. He wrapped up our conversation with an enthusiastic “SEE YOU TOMORROW AT 8.30” in his friendly American accent; I rushed back to the website to double-check what I’d gotten myself into. Unfortunately I’d missed a very clearly written disclaimer saying that they don’t fly above the temples due to government regulations, so I was a little disheartened, but to be honest the novelty of being in a microlight for the first time was exciting enough! My morning kicked into action with an overzealous tuk-tuk driver and breakneck trip to the airfield. Pulling up to the dusty red airstrip, we were greeted with an “OUT OF THE WAY!” from a man with a walkie-talkie. We lurched forward onto a patch of grass and the engine cut-out, the noise from the tuk-tuk instantly being replaced by the whirring of an aircraft from somewhere above us. “Eddie’s about to land,” said the walkie-talkie man in a slightly calmer voice. Squinting towards the end of the airstrip, I followed the triangular shaped microlight as it approached and quickly dipped down onto the airstrip. Within seconds it had gone from being air-bound to being right next to us. Eddie, and his first passenger of the morning, hopped out of the aircraft and removed their helmets. I rushed up to say hello, giddy with excitement. “Not just yet,” he said, “I’ve got someone else first,” and he turned to a man who’d appeared next to me, handed him his helmet and off he went again. 30 minutes later Eddie was back on the ground, shaking my hand enthusiastically as he introduced himself and went through the safety briefing. I was pretty keen to take up my camera so Eddie had to make sure it was well and truly strapped to my wrist. “If you drop the camera, we both go down,” he joked. I squeezed my head into my helmet to hide my expression and clambered into my seat. Microlights aren’t the biggest of aircrafts, so when there’s two of you the pilot basically has to sit between the passenger's legs. It’s definitely an interesting dynamic. Once Eddie was comfortably in his seat, he buckled himself in, switched on the engine and we zoomed forwards to the start of the airstrip. “Are you ready? !” he said through our radio headsets. I must have looked like a complete child as I grinned back and just nodded, completely lost for words. In the blink of an eye we were off the ground. 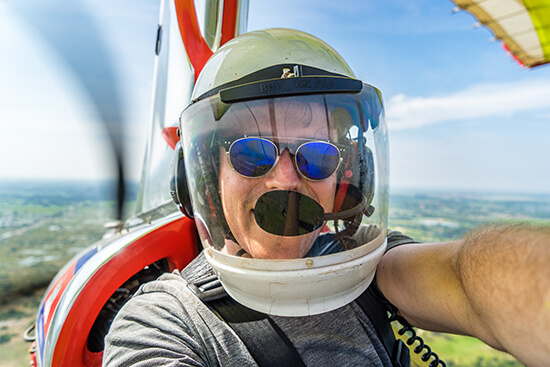 I should mention that I absolutely love flying, so at this point I was intoxicated with excitement, so much so that I can’t really remember the first minute of flying. After Eddie reported to air traffic control, he resumed his tour guide duties and began pointing out various landmarks. Crocodile farms, water villages, luscious green paddy fields galore. “Check those out!” Eddie exclaimed as we passed over a waterlogged field. Genuinely, all I could see was mud. “Water buffalo!” he quickly added, and my perspective totally changed as I began to notice a herd of buffalo carving up the field below me. 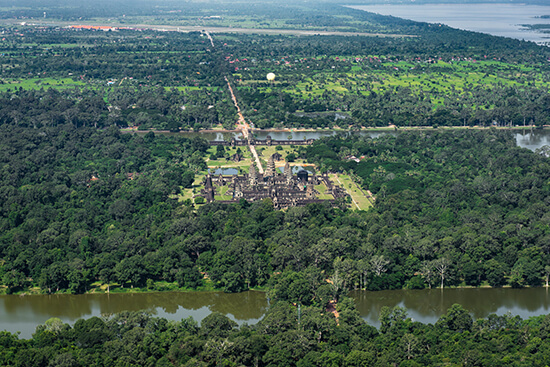 Siem Reap’s landscape, an expanse of dark greens and blues, was beautiful enough to keep me entertained, but then we started approaching temples. I’d initially thought we weren’t going anywhere near temples, but apparently flying right beside them is allowed! After a few temple flybys, my eyes locked on to a relatively small, shabby looking temple and my mind wandered off to a bygone era of Angkor awesomeness. Eddie’s voice crackled through the radio, “Ross, look up!” Ecstatic doesn’t come close to what I felt when I looked forward. Angkor Wat in all its temple-y glory was right there, smack in front of us, and for the next few moments, despite having a middle-aged man squeezed between my legs, it felt like I was the only one there. Simply put, this was one of the most incredible travel experiences I’ve had to date. If you get the chance to go to Siem Reap I’d definitely recommend it! Make an appointment with one of our Travel Experts today and they'll plan your tailor-made Journey to Cambodia so you end up with the holiday you want.